"You know, your audience isn't even born yet." Basquiat (1996), directed by Julian Schnabel; written by Julian Schnabel, Michael Thomas Holman, Lech J. Majewski, John F. Bowe; cinematography by Ron Fortunato; editing by Michael Berenbaum; music by Julian Schnabel and John Cale; produced by Peter Brant, Joseph Allen; distributed by Miramax Films; Awards: Won Special Recognition for Excellence in Film-making from the National Board of Review; for a full list of awards and nominations, go here. Normally, I’m not one for biopics. Nor biographies, mostly. I tend to dislike the attempt to make a life into a film or a text when not enough allowances are made for the fictive nature of that process. Schnabel’s film, for me, doesn’t err so much on the side of trying to make a drama out of the life, the way more ponderous biopics of artists do—such as Pollock, played by Ed Harris, or even Lust for Life, with Kirk Douglas as Van Gogh and Anthony Quinn as Gauguin. The effort to make a visual artist’s life manageable for film is bound to fail, we might say, but Schnabel’s Basquiat fails in an interesting way. And that’s largely because Schnabel, until he made this film, wasn’t a film-maker, but rather a visual artist of grand conceits. The conceits are here too, and their Schnabel’s, not Basquiat’s. 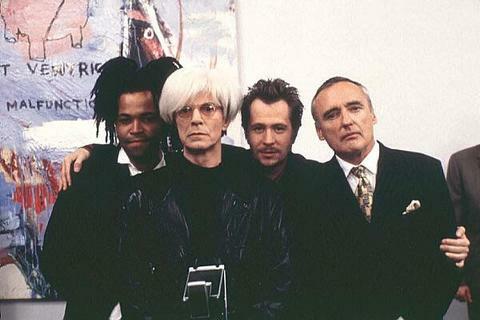 Some critics and no doubt many viewers who wanted “the skinny” on Basquiat found that off-putting. For me, the distortions an artist introduces into the story of a late, lamented “fellow artist” are part of the point. That said, I should also say I didn’t know much about Jean-Michel Basquiat (1960-88), the hero of this film, before seeing the movie the first time, other than that he began as a graffiti artist, with the famous tag “SAMO,” and that he created an individual, idiosyncratic art, generally called “neo-expressionist,” that he was a huge hit, and lived and died a New York artist at a time when being a New York artist had a kind of supreme cool that not many movie stars and film-makers could claim, to say nothing of lowly writers. The comparison was always to rock stars. Basquiat was a “rock star” of the art world, at a time when the idea of the rock star as the definitive cool way to make a living was peaking. Make a living, ok, sure, Basquiat did that several times over. But that’s not really the point was/is it? An artist, we suppose (strapping on our romantic-analytic goggles), is supposed to have something to say and to say it, against all odds. Basquiat did that too. Is he up there with Van Gogh and Pollock as the great and greatly doomed? I don’t know. It’s to Schnabel’s credit that he raises that issue but doesn’t feel he needs to address it. When art critic Rene Ricard (Michael Wincott) meets Jean-Michel (Jeffrey Wright) in the film, we’ve already heard his voice-over stating that no one in the art world wants to miss out on the next Van Gogh. Hey, presto—here he is! Ultimately, Schnabel’s not interested in who can out-Vincent Vincent, because, from the get-go, that’s all part of the machinery, and the machinery is where it’s at. And it has a killer soundtrack. From the opening credits with The Pogues’ “Fairytale of New York” (the first time I heard that, believe it or not) the film is on top of the game. So many great selections—Them’s cover of “It’s All Over Now, Baby Blue” (as Gina freaks on Jean-Michel’s decorative touches to her expensive dress), Tom Waits’ “Who Are You” and, feeling so right it’s almost overkill, “Tom Traubert’s Blues” when J-M gets the word on Andy’s death and watches footage of the actual Andy, and, perhaps the biggest gem, Keith Richards’ solo take on Hoagy Carmichael’s “The Nearness of You.” The music, in other words, isn’t merely incidental—Schnabel does indulge the ‘90s rage for MTV style set-pieces within the film, but at least the music chosen, in every case, can hold its own. Maybe what makes this film make my list, despite misgivings, is the need to find some movie from the ‘90s that connects with me—God knows, there aren’t many—and with a changeable idea I can return to. Basquiat, because it never directly addresses what makes art art, keeps that theme—the very definition of a changeable idea—in play throughout. How good is Basquiat, the artist? How good do you want him to be? How good is the film of Basquiat? Same thing. Granted, the film could be awful, but it’s not, but it also never tries to be “great.” It’s a series of vignettes, and some work better than others; some have the usual problem with any “insider’s” view: how to make this seem real and important to people who aren’t part of it? 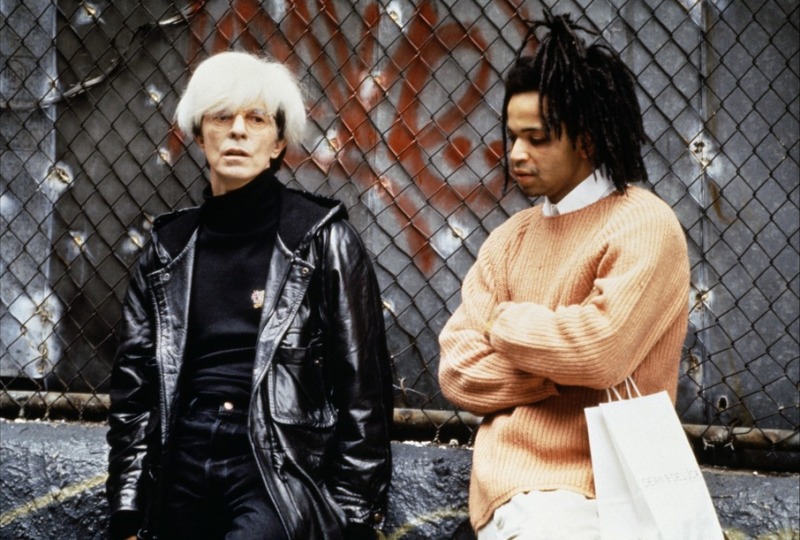 Schnabel has a feel for how any great career is attenuated—and accented and enabled—by the times, and he makes no bones about the state of the machinery at the point Basquiat enters the picture. 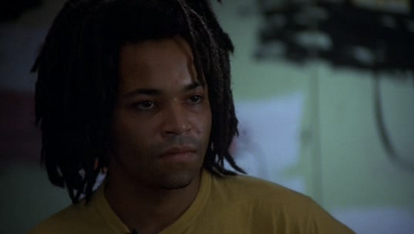 And unlike so many films that try to recreate an era, Basquiat simply seems to inhabit its. Much as Basquiat inhabited his. And habituated others to it. That’s what an artist does. At the heart of it all is Jeffrey Wright’s mercurial, quixotic performance. It’s an astounding portrayal because it seems to be in constant motion; you can never say “I’ve got it.” And it’s hard to say if Wright gets what he’s going for because what he’s aiming at seems to change as he aims. It’s as if he’s playing music with the other people in the film but is always a few beats off (the very definition of “off-beat,” I guess), though sometimes he’s ahead and sometimes behind, and sometimes it’s like he’s in an isolation booth and doesn’t even hear the other players. One of my favorite sequences has Basquiat, in pajamas, standing in an open jeep as del Toro drives, and the song on the soundtrack is The Pogues’ lyrical “Summer in Siam.” The sequence is one of the few in which Basquiat actually seems to be enjoying himself, and its risky and fun in the devil-may-care, I-walk-with-angels kinda way that is key to this portrayal of “the chosen one.” But it only lasts a few minutes. Nothing here goes on too long, and, like in a good collage, it all adds something to the composition. 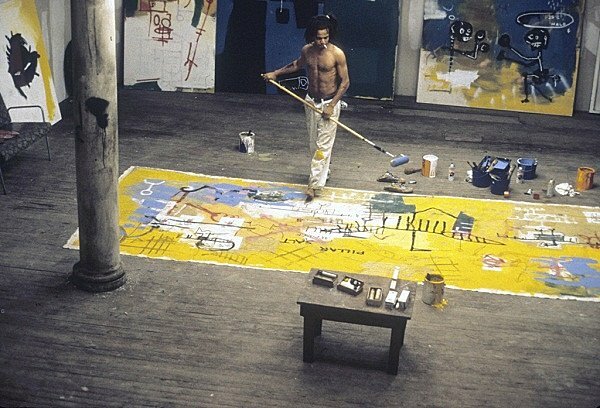 Basquiat’s estate did not permit the use of any of his actual artwork in the film, but the approximations are close enough without anyone having to pull out their art history textbooks to see which work he was doing when. It all floats in Schnabel’s mind’s eye, ultimately. Not a time “when gods walked the earth”—rather, a time when his friends were still around. “They flee from me that sometime did me seek.” That, friends, doesn’t change. Labels: 1990s, 50 Films Since 1970, analysis, favorite movies, film-viewing, list, movies, Whatcha Watchin?